Information about the MCW Metrobus will appear here in due course. 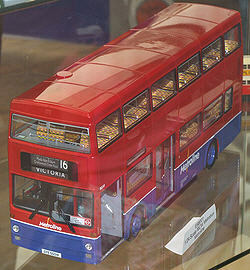 The 1/24th Metrobus model like the earlier large scale DMS is a joint venture between Gilbow and Best Choose. The model made its debut in 2007 in the form of a China Motor Bus single door model that was released in Hong Kong by Best Choose, the first UK version a dual door Metroline Travel bus was released shortly afterwards in November 2007. The model has working route blinds which like the DMS before allow five different choices of display, the model also has working folding passenger doors and steering. Opening futures include the rear lower deck emergency door and upper deck rear window. The rear engine cover also opens to reveal a fully detailed engine while internally the model is highly detailed with individual seats, handrails and authentic drivers cab area. A London Transport version was released in November 2008 and carried route blinds for Fulwell Garage. 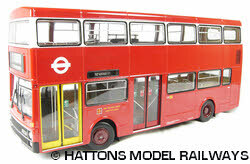 During 2011 EFE released a small batch of a second Metroline version to it's Subscription Service Members, this model had originally been commission by Metroline themselves and carried route blinds for Willesden Garage and seems to be identical to the proposed but never issued model 98002.